New Delhi: The Delhi Medical Council (DMC), looking into the case in which a newborn was allegedly wrongly declared dead by the Max Hospital in Shalimar Bagh, has given a clean chit to the hospital, ruling out any medical negligence on its part. In its report to the Delhi Police’s Crime Branch, which is probing the matter, the DMC said that “the hospital did not issue a death certificate for the boy who had some heart beat for about four-five hours”, as the family had signed the ‘Do Not Resuscitate (DNR)’ document, even after being counselled by doctors about resuscitation. Resuscitation is a life-saving emergency procedure that involves breathing for the victim and application of external chest compression to make the heart pump. Joint Commissioner of Police (JCP), Crime, Alok Kumar confirmed that the police had received the report from the DMC and said they would study it. The DMC recorded the statements of the boy’s family members and the hospital’s doctors and staff, and concluded that there “have been procedural lapses and inadequate documentation, which is probably due to the absence of standard operating guidelines when managing such cases”. “…No medical negligence can be attributed on the part of doctors of Max Super Specialty Hospital in the treatment administered to the complainant’s new born baby,” according to the medical council’s report. The baby boy was wrongly declared dead by the upscale facility after his birth on November 30. The boy died during treatment a week later at a nursing home in Pitampura. His twin, a girl, was still-born. The twins were delivered at 23 weeks of pregnancy. In its report, the DMC said, “As per international medical literature, foetus less than 24 weeks, if born, is an abortus and is not considered-viable and is not likely to survive”. The Delhi Registration of Birth and Death Rules, 1999, also prescribes that 28 weeks is the period of gestation for it to be viable, it said. The boy’s family had also claimed that they were handed the twins in a polythene bag. The patient’s family on its own, for the ease of carrying, requested for and put the babies in the non-chlorinated yellow bag kept in the labour room, which was neither permitted nor sealed or packed by the doctors or staff of the hospital, the hospital staffer said in their statement. The hospital did not issue a death certificate for the boy since the baby was not admitted in the hospital, as the family did not want to admit him in the NICU for further management. 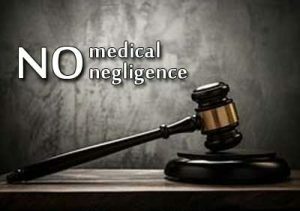 “There has been procedural lapses and inadequate documentation which is probably due to absence of standard operating guidelines when managing such cases,” the DMC report said. The case was transferred to the crime branch on December 6, the day the baby boy died at the nursing home in Pitampura, after battling for life for a week. The media will not publish this I think. They are usually busy bringing people down rather than boosting the morale of the people who do good work. They will publish and exaggerate what the politicians and so call celebrities are doing but not a word about the social work being done.